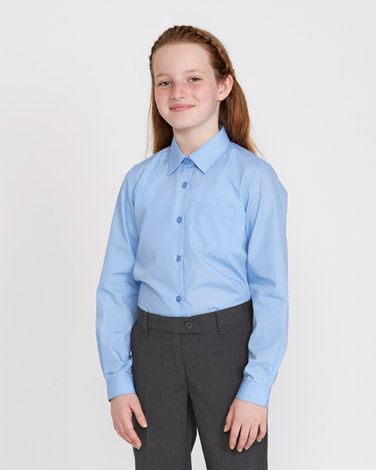 Great for a sharp, stylish and flattering look, our slim fit, long-sleeved, girls blouses are also designed with practicality in mind. Featuring a non-iron finish that allows you to simply wash the shirts, hang them up and dry, these are the ultimate time savers. With stain release technology to make washing simpler, these also boast expandable cuffs and an easy close feature (up to age 7-8) to make getting your kids dressed even simpler. A boned collar and curved hem ensure your little one looks good no matter how demanding the school day. Pack of 2.